The number of people arriving at U.S. land borders and ports of entry to file asylum applications has soared dramatically in the last year, and is now about 10 times higher than it was in 2009, according to statistics from U.S. Citizenship and Immigration Services (USCIS), the agency that processes these applications. The increase in so-called "credible fear" claims follows a 2009 Obama administration executive action that calls for such arrivals to receive a grant of parole into the country to pursue their asylum claim, rather than stay in custody pending a full review of their qualifications, as the law stipulates. Typically these migrants pay criminal smuggling organizations large sums to facilitate their passage through numerous safe countries in order to reach the U.S. border to claim a fear of return. Judging by current approval statistics from the immigration courts, ultimately few will be found qualified for asylum, but nearly all are allowed into the country, and they are not considered a priority for deportation under current policy. Late in 2013, Department of Homeland Security (DHS) officials and members of Congress raised concerns that the number of aliens caught crossing the southwest U.S. border illegally or arriving at the ports of entry without a visa and seeking asylum had increased dramatically over the prior year. 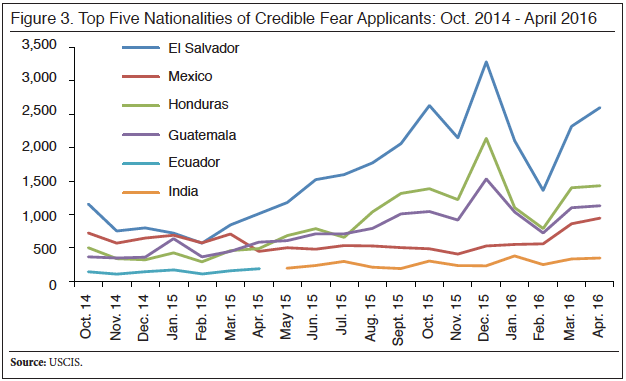 The House Judiciary committee held a hearing on February 11, 2014 to explore these concerns.1 At the hearing it was noted that approval rates for the so-called "credible fear" reviews — the first step in the asylum process — had increased dramatically in the prior five years, reportedly to the point where about 90 percent of all applicants were approved. It was further noted that USCIS had documented very high rates of fraud in the asylum application pool; specifically, an internal audit found that only 30 percent of the audited asylum applications were fraud-free. Committee chairman Bob Goodlatte remarked, "Unfortunately, ... because of our well justified reputation for compassion, many people are attempting to file fraudulent claims just so they can get a free pass into the United States." Most New Asylum Applicants Arrive at the Southern Border. As shown in Figure 2, the vast majority of new asylum cases filed since 2014 (64 percent) are being handled by the Houston asylum office, which covers the Texas and New Mexico border area. Another 16 percent are handled by the Los Angeles asylum office, which covers the California and Arizona border area. Only 20 percent of the asylum claims come from aliens arriving at the northern border and all other ports of entry outside the Southwest border states. Most Applicants Are from Central America. Most of the asylum applicants who arrived since 2014 are part of the inflow of illegal arrivals from Central America, specifically El Salvador, Guatemala, and Honduras. Aliens from these three countries make up 80 percent of all the new applications from border arrivals since 2014. 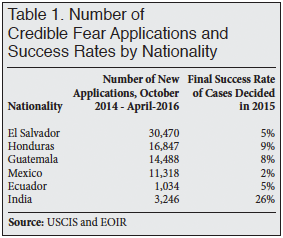 Early in 2015, the number of applicants from El Salvador in particular began to increase dramatically (see Figure 3). It should be noted that many of the Central American asylum applicants are family arrivals, not unaccompanied minors, who typically pursue other ways to stay. More than 11,000 applicants, making up another 15 percent of the total number since 2014, are from Mexico. The number of Mexican applicants has remained relatively steady compared to the number arriving from the three main Central American countries. The only non-Latin American country to rank in the top five nationalities of asylum seekers reported by USCIS is India. The influx of Indians appears to have heated up in 2013 along the Arizona border, and shows signs of being organized or facilitated by smuggling organizations, with some paying as much as $35,000 to be guided to the Nogales area.7 As shown in Figure 3, in 2015 the number of Indian asylum seekers began to exceed the number arriving from Ecuador, long a source of illegal migration through Mexico. Number of Haitians Also on the Rise. It has been reported that the number of Haitians arriving to seek asylum at the port of entry south of San Diego could surpass many of the other nationalities.8 According to a report uncovered by my colleague Kausha Luna, the Mexican government says that more than 11,000 non-Mexicans, of which the majority are Haitians, arrived in the state of Baja California in recent months on their way to seek asylum in the United States.9 Of these, more than half have already gone to the United States, and four to five thousand remain in Mexico waiting for their turn in a process now coordinated between the U.S. and Mexican governments. Mexico's immigration agency reports that it has granted 14,800 transit permits (salvoconductos) to migrants of all nationalities, and estimates that about 8,000 have crossed the California border and filed an asylum application. Many Are Invited, but Few Are Chosen. Statistics from the immigration courts show that very few applicants from the countries that make up this surge in new asylum applications will actually qualify to be granted asylum and eventual permanent residency. In fact, as Table 1 shows, most of these new arrivals have a less than 10 percent chance of qualifying, judging by the outcomes reported in 2015 for applicants from these countries. This record of outcomes raises questions as to the logic and effectiveness of current policies. If applicants from these countries are not very likely to be approved, then why are they being allowed into the country to make a claim? 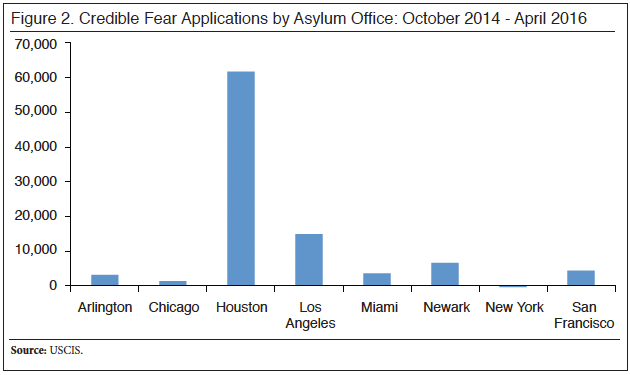 Why are USCIS asylum officers giving so many of these cases the green light upon the initial credible fear reviews? Why are so many being granted parole and released, when it is obvious that most will end up joining the illegal population and be subject to deportation? In 2014, the House Judiciary Committee approved a bill that would have addressed a number of the problems believed to be fueling the asylum surge, including strengthening the credible fear approval standards and addressing fraud problems.10 These reforms are constructive, but approval by both chambers of Congress seems unlikely in the near future. The executive branch need not wait for Congress if it wants to stem this tide of new illegal arrivals planning to take advantage of the current asylum policies. The easiest way to discourage this behavior without turning away qualified asylum seekers would be to turn them back at the border and direct them to submit their applications at our consulates in Mexico, and have them wait in Mexico to see if they are ultimately approved, as was the typical process prior to the 1996 immigration reforms. In addition, efforts to disrupt and dismantle the criminal smuggling organizations must be stepped up as well as efforts to interdict smuggled groups before they reach the border. Further, applicants who have passed through or even been living in safe third countries prior to their arrival at the U.S. border should be returned to those countries to make their asylum claim, in accordance with international agreements. 1 "Asylum Fraud: Abusing America's Compassion? ", House of Representatives Judiciary Committee Hearing, February 11, 2014. 3 "Parole of Aliens Found to Have a Credible Fear of Persecution or Torture", Immigration and Customs Enforcement Memorandum, December 8, 2009. 4 See Mark Metcalf, "Built to Fail", Center for Immigration Studies, May 2011. 5 Dan Cadman, "Asylum in the United States", Center for Immigration Studies, March 2014. 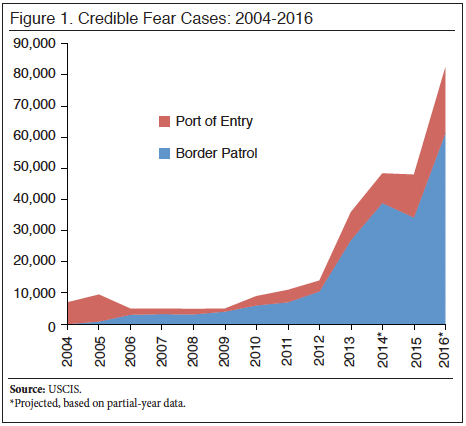 6 Unless otherwise noted, the statistics in this report come from the USCIS Asylum Division's quarterly "Credible Fear Workload Report Summary". Complete reports for fiscal years 2014 and 2016 could not be located on the USCIS website, so final year estimates for those years are based on the monthly averages reported in the latest report available that fiscal year. Since the number of applications was growing steadily in each of those years, these estimates are likely to be lower than the actual year-end totals. 7 Daniel Gonzalez, "Immigrants from India surge across Arizona border", Arizona Republic, September 8, 2013. 8 Stephen Dinan, "Mexican officials quietly helping thousands of Haitian illegal immigrants reach U.S.", Washington Times, October 10, 2016. 9 Antonio Heras, "Piden asilo en EU más de 11 mil migrantes", La Journada, October 12, 2016. 10 "Asylum Reform and Border Protection Act of 2014".